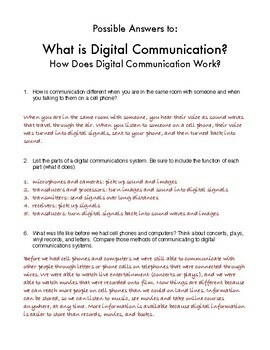 What is Digital Communication? 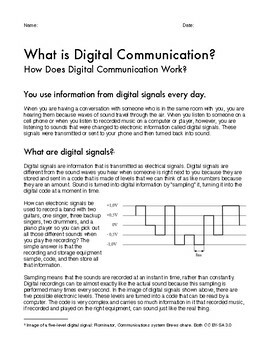 How Does Digital Communication Work? 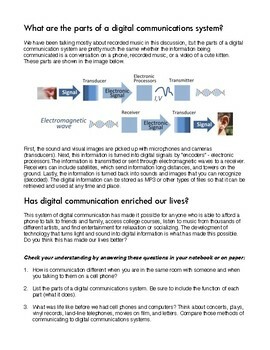 When we communicate on a cell phone, download a movie, or listen to an MP3, we are using digital communication systems. These systems involve turning analog (sound and light) information into coded digital signals then transmitting this information by sending it to satellites, towers, or directly to its destination. The information is then "decoded" and turned back into sounds and/or images. Digital communiocation systems can be found in the 2016 Massachusetts Science and Technology/Engineering Standards and are a part of technology curricula in other states as well. Designed to be at a grade 7/8 reading level. Four questions check comprehension. Answer key included.